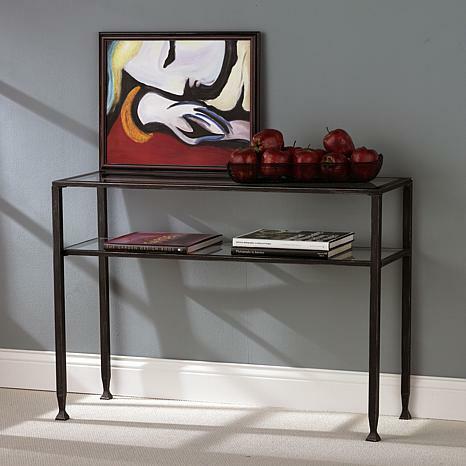 Create an elegant atmosphere in your home with this sleek contemporary sofa table. 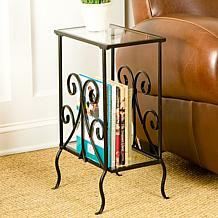 The solid metal frame is constructed of square tube with flared feet. A lower shelf is recessed approximately 6" below the top creating a shadowbox effect that is perfect for books, potpourri, or collectables. 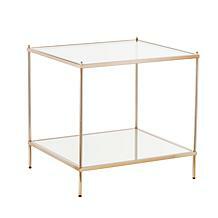 The top and lower shelf are inset with solid pieces of tempered glass while the frame is finished with brushed black paint. 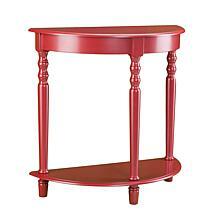 Use this contemporary sofa table to accent the décor in your home. Looks good in my livingroom. 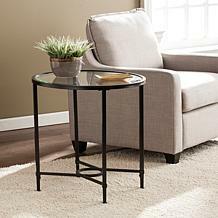 I love the sofa table goes good in my living room. i got this table for my computer but my family thought it was small but it just rt for what it made to be.